Nottingham Forest knocked Premier League Newcastle out of the Carabao Cup for the second consecutive season after a dramatic finale. Championship outfit Forest took the lead in the second minute when former Newcastle striker Daryl Murphy nodded in Sam Byram's cross from close range. Newcastle equalised in the second of six minutes of injury time when Salomon Rondon angled in a powerful low shot. But two minutes later Matty Cash fired home before Gil Dias' late chip. 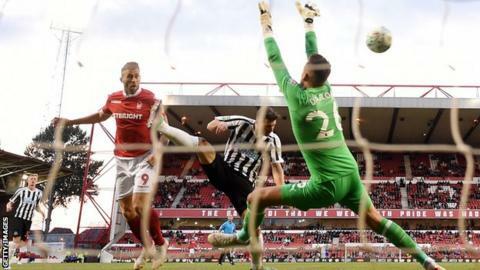 Forest met Newcastle at the same stage of competition last season and claimed a thrilling 3-2 victory at St James' Park. The conclusion to this match was just as enthralling as Forest deservedly secured their place in the third round. Aitor Karanka's side had taken the lead when on-loan West Ham full-back Byram crossed for Murphy at the near post. Murphy, who scored six times in 18 appearances in all competitions for Newcastle, escaped his marker and glanced a header past Newcastle goalkeeper Karl Darlow. Murphy almost had a second five minutes into the second half when Darlow fumbled a shot from Dias, only for Federico Fernandez to make a brilliant last-ditch block. Darlow, a former Forest player, made a crucial save just after the hour mark when he pawed away an audacious chip from Joao Carvalho. Forest seems to be cruising to the finish only for substitute Rondon to equalise with clinical finish - Newcastle's only attempt on target in the match - after a clever pass from Ayoze Perez. However, Forest hit back when Darlow parried Dias' shot and Cash arrived in the penalty area to slide the ball home. Newcastle then had a strong claim for a penalty when Luke Steele bundled over Perez inside the box but referee Jeremy Simpson waved play on. The impressive Dias then caught Newcastle on the counter and superbly chipped Darlow to seal the victory. Forest boss Aitor Karanka: "It was great to win against a Premier League team of their quality and experience. "We never give in until the end and we showed that again today. We always believe. "I can understand Newcastle's frustrations throughout the game. But we have a very good squad, good strikers and showed we are clinical at the end." Newcastle manager Rafael Benitez: "I don't agree that Forest were the better team and I'm not concerned by how we played. We did not create many chances so we need to improve in attack and keep working hard. "It's a long season, we need it was going to be hard but we have confidence in ourselves." Match ends, Nottingham Forest 3, Newcastle United 1. Second Half ends, Nottingham Forest 3, Newcastle United 1. Ayoze Pérez (Newcastle United) is shown the yellow card. Goal! Nottingham Forest 3, Newcastle United 1. Gil Dias (Nottingham Forest) left footed shot from outside the box to the centre of the goal. Goal! Nottingham Forest 2, Newcastle United 1. Matthew Cash (Nottingham Forest) right footed shot from the centre of the box to the bottom left corner. Foul by Christian Atsu (Newcastle United). Goal! Nottingham Forest 1, Newcastle United 1. Salomón Rondón (Newcastle United) right footed shot from the right side of the box to the bottom left corner. Assisted by Ayoze Pérez. Gil Dias (Nottingham Forest) wins a free kick in the defensive half. Jack Robinson (Nottingham Forest) is shown the yellow card for a bad foul. Substitution, Nottingham Forest. Matthew Cash replaces João Carvalho. João Carvalho (Nottingham Forest) wins a free kick in the defensive half. Attempt missed. Gil Dias (Nottingham Forest) left footed shot from the centre of the box is close, but misses to the left. Assisted by Daryl Murphy. Attempt missed. Fabian Schär (Newcastle United) right footed shot from outside the box is too high from a direct free kick. Substitution, Newcastle United. Jacob Murphy replaces Yoshinori Muto. Joselu (Newcastle United) is shown the yellow card. Michael Hefele (Nottingham Forest) is shown the yellow card. Joselu (Newcastle United) wins a free kick in the attacking half. Foul by Michael Hefele (Nottingham Forest). Attempt missed. Gil Dias (Nottingham Forest) left footed shot from outside the box is high and wide to the left. Assisted by Ben Watson. Attempt blocked. Yoshinori Muto (Newcastle United) left footed shot from the left side of the box is blocked. Assisted by Joselu. Ben Watson (Nottingham Forest) wins a free kick in the defensive half. Substitution, Newcastle United. Ayoze Pérez replaces Federico Fernández. Attempt blocked. Ki Sung-yueng (Newcastle United) right footed shot from outside the box is blocked. Assisted by Fabian Schär. Gil Dias (Nottingham Forest) is shown the yellow card for a bad foul. Ciaran Clark (Newcastle United) wins a free kick on the left wing. Foul by Gil Dias (Nottingham Forest). Federico Fernández (Newcastle United) wins a free kick in the defensive half. Kenedy (Newcastle United) wins a free kick in the attacking half.